Knotty Pines is a great way to get an eye opening experience to a great Blue Ridge cabin rental. Knotty Pines is a two bedroom cabin great for couples, pairs of couples, or small families. It is a very cozy cabin loaded with all the right things to make your get away a perfect one. Inside the cabin and on the property you will get an instant sense of relaxation. Sit and relax in a comfy chair on the covered porch enjoying all the sounds of nature Just off the porch is a fire pit, great for those cool evenings to get some smores and hot dogs. While inside the main floor you can enjoy the open floor plan from the kitchen/dining room and living room, great for conversation, watching tv, and enjoying one another's company. Outside by the fire pit is as relaxing as it can be. Enjoy the open flames in one of the Adirondack chairs and just sit and look at the night stars.. The quietness will overcome you while at this property. The location is quiet and private, in an area known for nature, but less than 10 minutes from town. 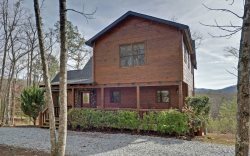 This Blue Ridge Mountain Cabin Rental is located approximately 10 minutes from Downtown Blue Ridge, GA. The cabin is in the Cherry Log, GA area, which is very close to the USFS, Adventure Trail Rides for Horseback Riding, Blue Ridge Canopy Adventures, Firewire Zip Lines and Lake Blue Ridge. Also, the Benton McKay Trail runs adjoining to this property. Knotty Pines is very private, is in a quiet area, and makes great memories for a Blue Ridge Cabin Rental. Marvelous team and friendly. attentive to our every need. Very professional, helpful and friendly! Very pleased with accommodations and staff and was of booking! Highly recommend it! Very pleased with accommodations and staff and was of booking! Loved it, will be back. Good informative emails. Making a reservation online was quick and easy. The whole process was smooth and orderly. Very comfortable, cozy, and clean cabin. When I called after booking they were very informative. We loved our stay and trip had to be cut shorter than expected due to work issues. Would love to come again someday. Very friendly and helpful! They took care of an accidental duplicate pet fee quickly and without fuss, and they were very helpful when their website was having issues with confirmation emails after I made my reservation online. Couldnt ask for better customer service! The most relaxing time weve had in years! The property was beautiful, well kept, and in a location convenient to stores and attractions yet secluded enough to provide ample privacy. We had plenty to do around the area, and many choices for entertainment at the cabin itself. We will definitely be back! Everyone was friendly and helpful. I'm glad they took the time to demonstrate opening the lock since those can be tricky. As an aspiring novelist, I needed three nights to get away to a pleasant setting away from all the distractions of home and get some writing done. Mission accomplished! Knotty Pines is cozy and relaxing, and I greatly enjoyed the view from the dining room table as I sat there working away in the mountain air. The Georgia Mountain Cabin Team was very friendly and accommodating. Knotty Pines was a winner- very clean and cozy. It was exactly what we needed. The kitchen was fully stocked and there were plenty of in-door and outdoor activities right on the property. We were very pleased with this cabin and enjoyed our stay. Knotty Pines was great! Had everything we needed. Private and quiet location but very close to town. My kids loved the could play and explore outside. Hot tub was perfect. We will be back! Georgia Mountain Cabins was excellent. Knotty Pines exceeded our expectations and we will be back. Had all we needed and more. Perfect location, close to Blue Ridge and Ellijay. Knotty Pines is a perfect cabin. Close to hikes, great hot tub to come back to and all the things you need for a great vacation. We will be back! The woman that checked me in was very friendly and accommodating. Process of booking was easy, i like that you offered a discount code for stays over 2 nights. We loved that everyone is so nice with the company as well as around town! Can't wait to return! Our favorite feature at Knotty Pines is the hot tub!!! !